Hey ladies...and maybe a couple of gentlemen! I'm over at Maggie's again today...you can come check out my Cocktail Night In post over there...but not before you read about her fun Christmas group date idea... 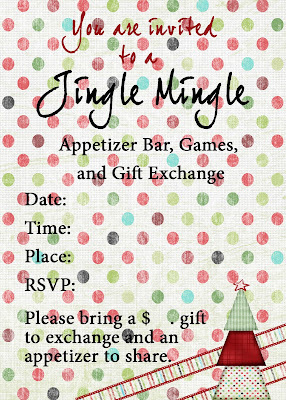 If you've already got plans for a Christmas party this year, be sure to put this one in the files for next year!! 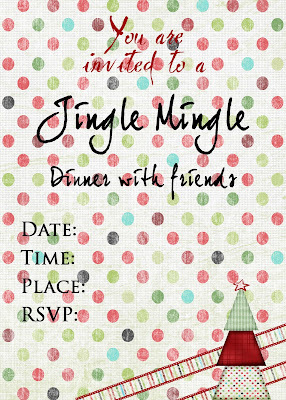 What is a Jingle Mingle? Well… that could be up for interpretation. Usually it is a party hosted by one couple for a few other couples to celebrate the Holiday season. Sometimes it means a sit down dinner, but usually it is more of an after-dinner get-together with appetizers and drinks. As the wanna-be dinner party guru that I am, it has to be something fun and festive with lots of atmosphere! 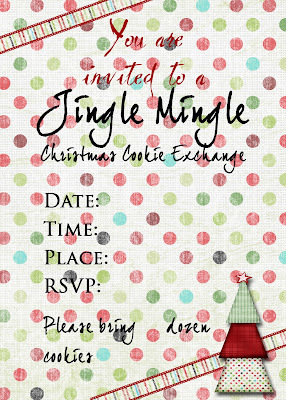 For this blog swap, I have created 3 variations of a Jingle Mingle (and included 3 different invites that you can download, print and send out!!!). Also included are printable accessories to make your table look great! For this party you first need to decide which invitation to send out. Now that you have decided which of these 3 fun parties to host the hard part is over! On to the fun part of planning…..
Décor: It’s Christmas time so you should have your house already decked out for the holidays. Very little extra is needed. For a dinner use linen tablecloths and napkins, or at least attractive holiday patterned paper (not plastic) tablecloths. On the buffet put some garlands or poinsettias or those extra decorations that you have in storage. Burn a Christmas candle and play some soft instrumental or easy listening Christmas music. For the Cookie Exchange go a little more casual and crank up the Christmas music!!!! RSVP: Make a quick call to those that you haven’t heard from to verify if they are coming. In our culture RSVP seems to be optional to many (Having a guest count is crucial to party planning.) Tell them that you are wanting to make sure to have enough of everything. Too many desserts and only one main dish could be very bad! I know because that happened to me at one of my first parties. 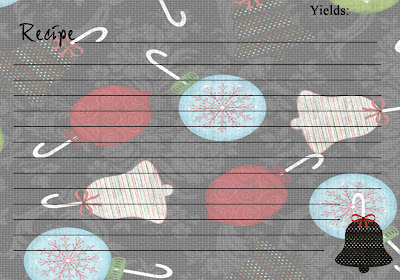 Gift Exchange: Make sure that you write on the invite that each person (or couple) needs to bring a gift valued at $5 or $10. Have a couple extras on hand for the person that will forget. Cookie Exchange: This can be a lot of fun with couples! I have had 12 couples attend with each bringing 5 dozen. We just did quick math to figure out that each couple’s plate would get 4 of each variety with one dozen left on the bar after the exchange for all couples to dig into and sample and drink yummy Wassail or Red Christmas punch. Because December is a busy month only 70-80% of those you invite to come may be able to come, so invite a few extra so that you get the number of couples you want to come. As the host you provide the drinks and the trays for the couples to take the cookies home on. One thought- Since most of the guests (the women) will have been baking that day they may be in the mood for appetizers, rather than more sweets. Instead of eating cookies at the party you could have an appetizer bar with drinks. Some inexpensive appetizers include- Bruschetta, Bacon wrapped waterchestnuts, chips and dip, veggie tray, pizza or bagel bites, and soup in a crockpot. If you don’t want to provide all of them be sure and make a note on the bottom of the invite that they need to also bring an appetizer to share. Family Traditions Truth and Lies- Like the game 2 truths and a lie. Have everyone tell EITHER 2 real traditions and 1 fake tradition and have them guess which tradition is a phony….. or 2 fakes and 1 REAL tradition and have them guess the REAL one. Guests can either write them down on a paper putting their name on the paper to be read aloud… or go around in a circle and let each couple share them on their own trying to disguise the answer. This can be a riot and so tricky!!! 1. We wake up to open presents every year before the sun rises. 2. We give our kids a gift that starts with the first letter of their name to open on Christmas Eve. 3. We don’t have stockings, we set out shoes instead for Santa to fill. It’s a Mexican tradition. If I Were A Christmas Cookie- Let each person take a turn telling everyone which type of Christmas cookie they would be and WHY! Or which cookie they think their spouse would be and why! (this would be especially fun at the Cookie Exchange party) Example- My husband would be a Mexican Wedding Cookie because he is the palest guy I know with a cute round gut, a little bit nutty…. But so sweet. Christmas Memories- This isn’t really a game, but is a more organized way to encourage conversation. Each person takes a turn sharing a favorite funny Christmas memory. For the menu download print it onto 5x7 photo paper (use a Sharpie to write menu on it as it is glossy) or print onto cardstock. Place it next to each placesetting for guests... or lay it across each plate. For the placecard it works really well if you download the design and then upload it to Costco or Walmart.com and have printed as wallets. The size is perfect as a wallet and the quality is exceptional. Use a Sharpie to write each guests name on it. You could stand it up next to their water glass, or using a pop dot you can attach to an ornament and have next to guests plates. 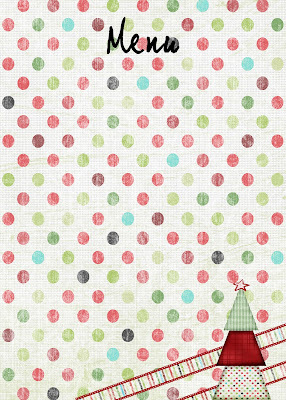 Party Favor Idea: The recipe cards on Maggie's Blog can be used for the cookie exchange as a party favor. You can make a recipe book by downloading the recipe cards and printing on matte paper, punch two holes on the left side and make a booklet with ribbon or small metal rings. You could also use the recipe cards as a way to label the different appetizers or cookies. Print off the cards below as wallets. Attach them to kabob sticks, toothpicks, coffee stirrers or whatever you can find. Have guests write the name of their dish on the recipe card with a short description, if necessary and stick into the appetizer or dish. 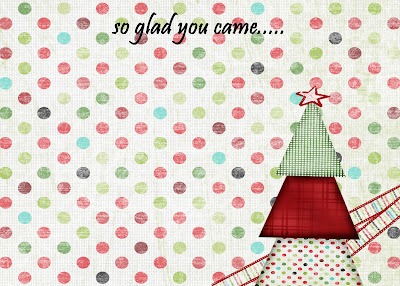 There are lots of other cute recipes cards like this one on Maggie's Blog. Go check out Maggie's original post to grab all the fun, free downloads! What great ideas! Thanks! Too bad I'll probably never make the time to use them. The glossy photo paper for the menu is a great idea, well written article! We are having a co-ed cookie exchange next Thursday night and an all girl one on Tuesday morning. I am so excited! I used the invite from this post. I even used red, green and black Sharpies to make the writing look super Christmasy! The guys seem as excited about it as the girls. They are determined to WIN the competition for best tasting cookie and best looking cookie. I couldn't download the invite. Do I have to have 4share system to do it? It says it's invalid, otherwise...hlep please! I don't know what 4share really is.